Shropshire is a popular holiday destination for history lovers, food lovers and lovers of the great outdoors alike. There's walking, there are ruins - churches and castles, both. There's a stunning Roman town to explore and, And when it comes to holiday accommodation, you're going to be spoilt for choice. And it has some truly lovely hotels to make your stay really special. Shropshire hotels come in all shapes and sizes. We've stayed at both the Albrighton Hall Hotel just outside Shrewsbury and The Feathers in Ludlow and felt very well looked after. We also had a lovely lunch at The Stiperstones Inn, recovering from exploring Snailbeach Mine and getting ready for an afternoon walk. Everywhere we went in Shropshire the welcome was friendly and food and beer just hit the spot. Shrewsbury makes an excellent base to explore the north of the county. The town itself has a castle, an abbey and plenty of pretty old houses to explore. You can stroll along the river or wander the lanes, stopping in one of the many hostelries for refreshment. Wroxeter Roman town is only a short drive away, as are Haughmond Abbey and Snailbeach Mine. Ludlow is an equally good base to explore from and easily lets you meander through the south of the county and into Herefordshire. Ludlow has a castle and some lovely old buildings, and of course, it's famous for its food scene, so make sure you check out the food centre and explore on market day. From Ludlow, it's easy to visit Stokesay Castle and Much Wenlock and then you're right in some prime walking territory. Heading west toward the border between England and Wales brings new delights. Fantastic walking - try Offa's Dyke Path which winds up the hills from Knighton and offers some spectacular views - gorgeous little towns like Clun and Bishop's Castle, landscape to drool over and some exceptionally fine ruins. If you love medieval history, this part of Shropshire will sing to you of a thousand years of strife. It hardly matters which part of Shropshire you visit. Minerals, fossils, ruins, churches, castles and grand houses... there's something for everyone. 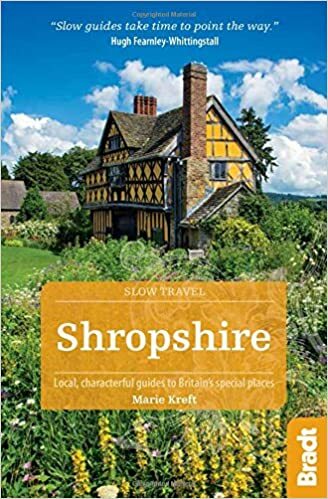 And best of all, some of those grand sites have been turned into hotels, so you can stay in spectacular surroundings and enjoy the best food that Shropshire has to offer. Really now... what's not to like about that? Now that you've explored Shropshire hotels and found a place to stay, please check out this page for ideas what to do and see.